Create your own awesome ocean paradise with SpongeBob’s super album of seabed sticker scenes! Stick in comic stickers of all the ocean friends to make Bikini Bottom come to life. There are jellyfish, Krabby Patties, Squidward, Patrick and (of course!) our square-panted star. Create your own cool ocean scenes to see why, for SpongeBob, life’s a beach! awsome you get put the spongebob stickers in a sticker albem.Thats ACE!!!!!!!!!!!!!!!!!!!!!!!!!!!!! 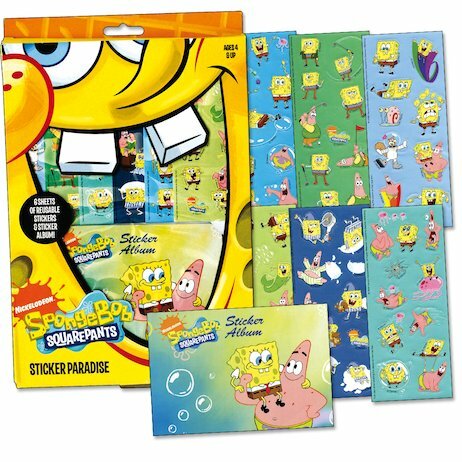 This Sticker Paradise is so good because you get to stick your spongebob stickers in it very own sticker album!!! I LOVE IT!! !